Claude Bosi @ The Cube by Electrolux A Global Feast for the Olympics! Dave aka Cork Gourmet Guy is a friend of mine and he’s also a bloody good chef. 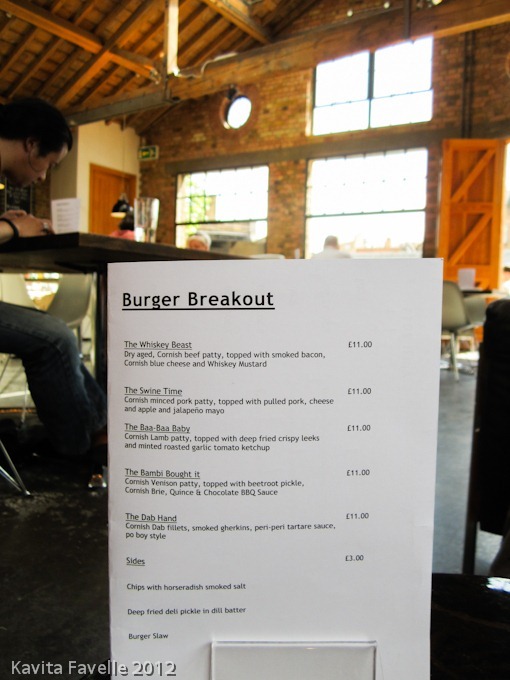 So when he announced his Burger Breakout popup, it went straight into the diary. It was hosted at 06 St Chad’s Place, a stunning space that was once a train repair shed and has been transformed by the architectural group that own it. 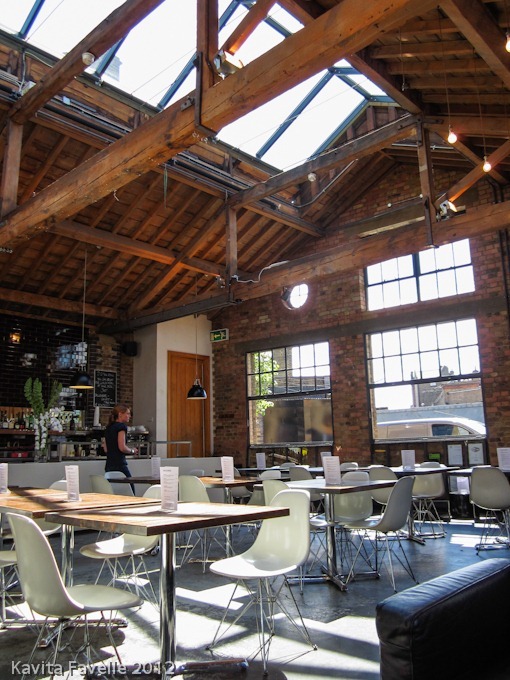 It was a great venue from the customer point of view but I know that very limited kitchen space and, more importantly, cold storage, made it difficult for Dave and his kitchen helpers. 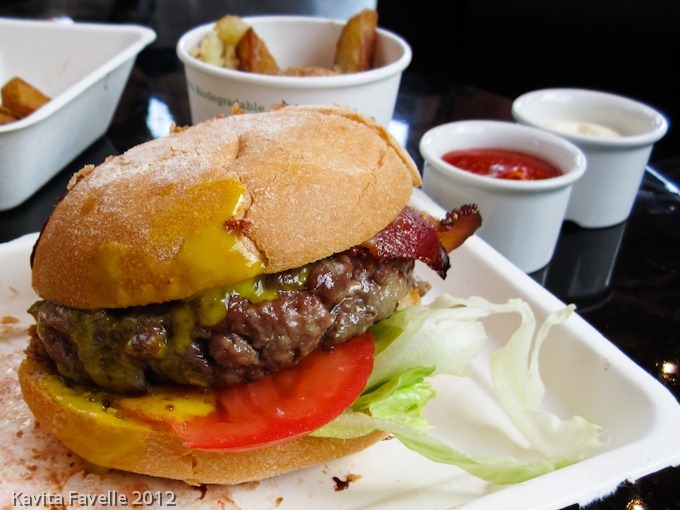 Dave had designed 5 burgers, all priced at £11 including a side portion of chips. Deep fried pickles, burger slaw and extra chips could also be ordered. 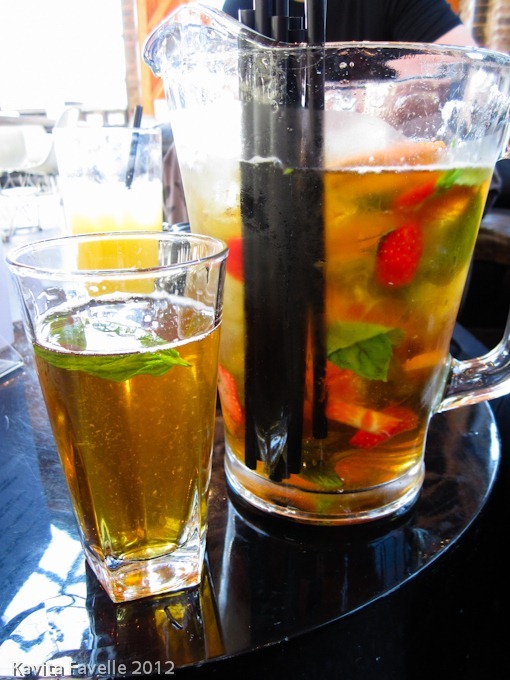 Perhaps a little overexcited by the arrival of summer, after so many months of rain, I ordered an entire (enormous) pitcher of Pimm’s for myself. Various beers were available at the bar, and the normal range of other stuff. Pete and I shared two burgers, the first of which was named The Bambi Bought It. 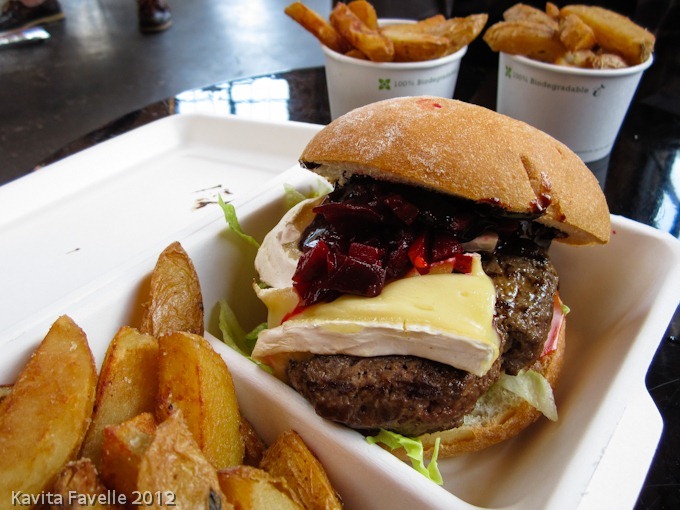 Served in Dave’s choice of sourdough bun (for stability), this was a juicy Cornish venison patty with beetroot pickle, Cornish brie and Dave’s rather special quince & chocolate BBQ sauce. The sauce was thick, like Marmite, or perhaps closer to tar, and very intense, but worked superbly against the sweet sharp pickle and creamy cheese. The chips were a little over salted for me, but still excellent. Our second burger was The Whiskey Beast. (Dave used Jim Beam, I think, so yes, whiskey with an “e”. Plus he’s Irish, so you know, fair play!) This one, also in the sourdough bun, contained a dry aged Cornish beef patty, smoked bacon, Cornish blue cheese and Dave’s whiskey mustard. Perfectly cooked beef, a good balance of condiments and that sweet sharp kicker of mustard sauce, with just the faintest hint of whiskey, this was also a bloody good burger! 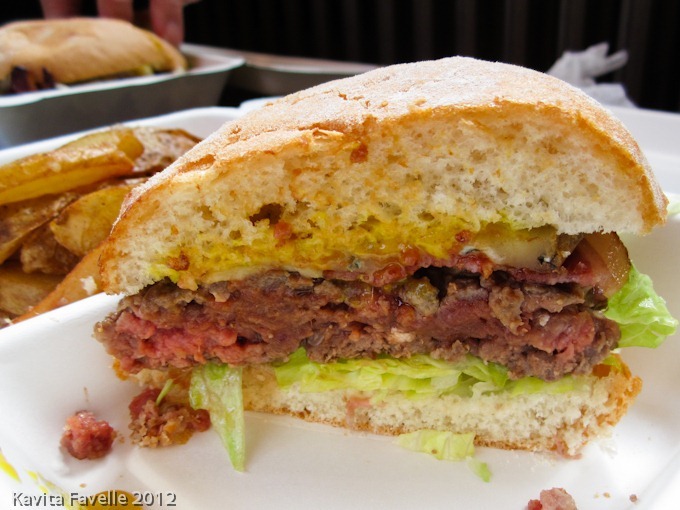 The burger slaw didn’t work for me – too much mustard and not enough crunch. 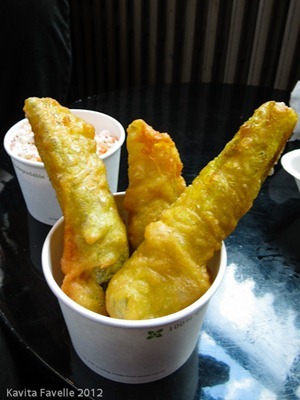 But the deep fried deli pickle in dill batter more than made up for it, served piping hot, these were intensely juicy and sharp with the lovely crisp coating of batter. I’d have preferred smaller pieces, to get slightly more batter to pickle, but they were superb as was. 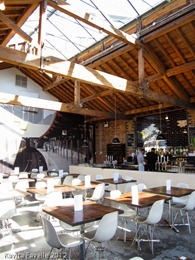 Meat and fish were provided by Cornish Grill, suppliers of Cornish produce to London restaurants. They’ve also hosted a series of popups themselves over the last few months. To keep up to date with further Burger Breakout dates, follow Dave on twitter or subscribe to his blog. 6 Comments to "Dave Aherne’s Burger Breakout"
Ah I was wondering why it had a Cornish theme! Left me salivating; so time for breakfast I think! This place looks incredible! I’ m going to have to go next time I’m in London! 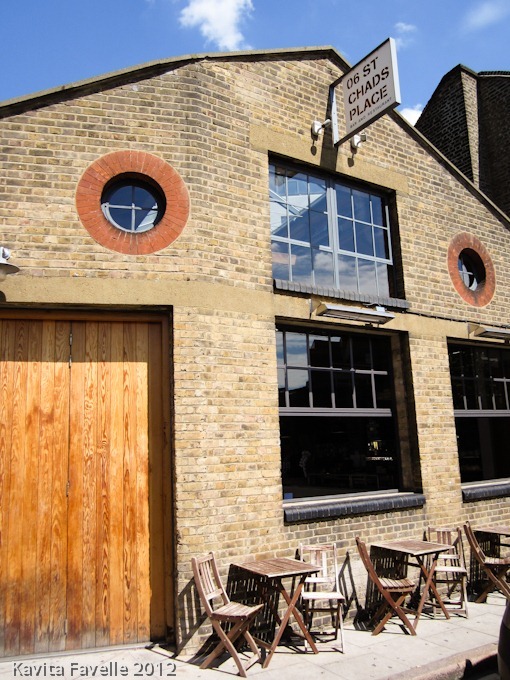 It was a one-off pop up but I believe Dave is planning to repeat it, probably in another venue. I’m crazy about those deep fried pickles! They’re so moreish aren’t they? 🙂 Love the names that he has given the burgers! Yeah, very cute names! And definitely, on the pickles!